CNET gave SysTools Exchange Mailbox to Office 365 , a 5 star rating for its efficiency & accuracy in delivering user result. The Office 365 Migrator helps you convert multiple mailboxes from Exchange EDB to Office 365 in a single go. It is possible to export mailboxes in respective MS Office 365 user account using the mapping option. As you launch the software and click export, software loads the Active Directory console of your Live Exchange Sever. 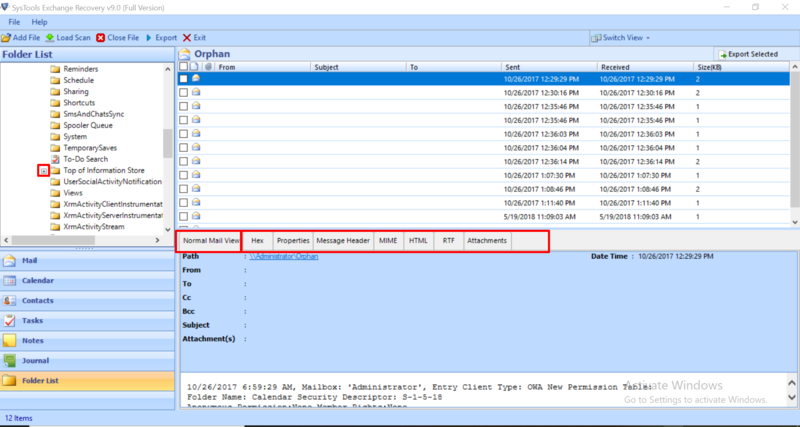 This will show the Active Directory details like: all mailboxes present in it, count of all the items present within the mailboxes. With the help of Exchange to Office 365 migrator, you can export and save the data of one mailbox into the respective Office 365 user accounts. This mapping can be done by providing the Office 365 account credentials for each user corresponding to the respective Exchange mailboxes. By default the software allows you to migrate all items of a mailbox into Office 365 like: emails, contacts, calendars, tasks, notes etc. But, as per your requirement you can check or uncheck the items and convert only selective items into Office 365 account(s). If you are switching the platform from Exchange to Office 365, then after migration, the data within Exchange Server will not be of much use. In this case, the software comes with an option to 'remove or permanently delete' emails from Exchange mailboxes after being migrated. During migration of data from Exchange EDB to Office 365, you can apply email filter to export selective set of messages only. Set a date range of "To" to "From" and the software will only convert emails residing within the specified date range. This filter will work only for emails, while rest of the items will be completely converted. Once the Exchange to Office 365 migration begins, you can view the current status of the conversion. Software will show you the mailbox authentication status and count of each items being converted along with the speed of migration. Once the migration finishes, tool will generate a final report of the same. Microsoft .Net Framework 3.5 and above. Microsoft Outlook 2000/2003/2007/2010 (32-bit) should be installed and configured for a POP3 Profile (Not Configured for Exchange). Migration machine should be in same domain with Exchange Server And Exchange mailboxes should have full admin rights. If you are using Window 8.1/8/7 or Vista, then please launch the tool as "Run as Administrator". Can I get a brief idea about the Offline EDB to Office 365 converter? Can I migrate from Exchange EDB to Office365 without its login credentials? No, you must know the login User ID and Password of Office365 account to migrate Exchange data to Office365. Without the credentials migration is not possible. 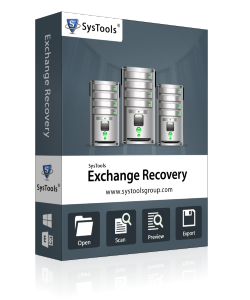 Is Live Exchange Server required for migration using this tool? Yes, Exchange Server should be active as well as in the same domains that of the migration machine on which tool is installed. Does this software support bulk Exchange mailboxes migration? Yes, software supports bulk conversion. You can export multiple Exchange mailboxes to Office365 account at a time. Is User ID and Password of each Office365 account required? Yes, you must know the user ID and password of each Office365 account to which you want to migrate Exchange data. And in addition to that you will have to enter the credentials manually. Will this software run on a Windows 8 PC? Yes, you can install and run this software on any Windows machine including Windows 8 as well. Can I migrate only emails from one of my Exchange mailbox? Yes, you can migrate the data of Exchange mailbox with respect to categories such as emails, contacts, calendars, tasks, etc. to Office365 account. Mention the O365 Subscription plans supported by the tool to migrate mailboxes from Live Exchange Server? The tool supports Operating System Versions such as Windows 10, 8, 7, XP, Vista, etc. to migrate Exchange data to Office 365. Microsoft Exchange to Office 365 migration tool can export data from both priv and pub type EDB files. This utility gives option to migrate mailboxes as well as public folder data into Office 365 account. There is a possibility for the Exchange EDB file to get corrupted according to the circumstances. The tool reads damaged EDB file and moves all data from Microsoft exchange EDB file to office 365 without any data loss issues. MS Exchange to Office 365 migrator allows the users to do customized migration by exporting all or selected mailbox into business Office account. The mailboxes and folders which are to be converted can be chosen by using the associated check boxes. Exchange to Office 365 converter provides mapping option for the user to move Exchange 2003/2007/2010/2013 mailbox to office 365 account. Mapping can be done by providing the exchange mailbox name and desired o365 user account credentials on software window. Multiple mailboxes mapping can be done using CSV file also. While migrating multiple mailboxes into multiple Office 365 accounts, validation of each account is required. Software comes with impersonation feature that allows validation of all account in a single go instead of validating each account one by one. For this, input the O365 admin mail account and the password. In order to migrate few i.e. desired emails into Office 365 account, tool has option to do selective emails migration only. To include the required emails for migration, their respective check box should be selected. After that right click on the selected emails to proceed for export process. By default, the tool will migrate all the mailbox contents to the Office account. In order to avoid the migration of unwanted elements, category selection feature can be opted. It allows to optionally include or exclude items such as emails, contacts, calendars, tasks, etc. This tool offers a filter option by which the data within a specific range of Date can be exported from the Microsoft Exchange EDB file to Office 365 account. The specification of From and To Date is needed to proceed for migration. 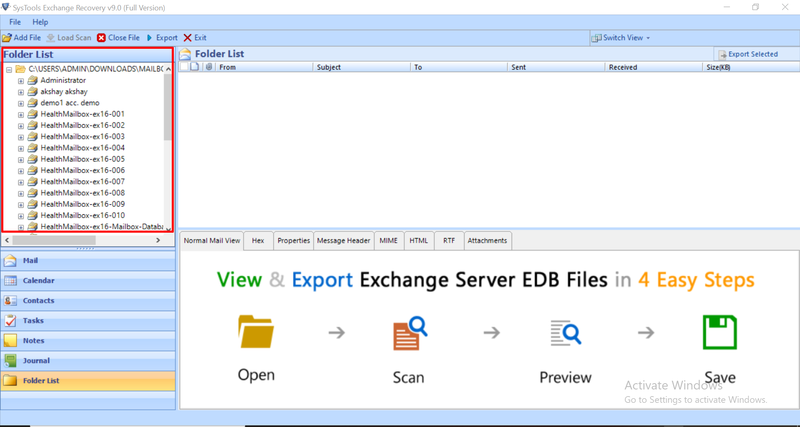 Allows to preview the files as well as to convert upto 25 items per folder from Exchange EDB mailboxes. 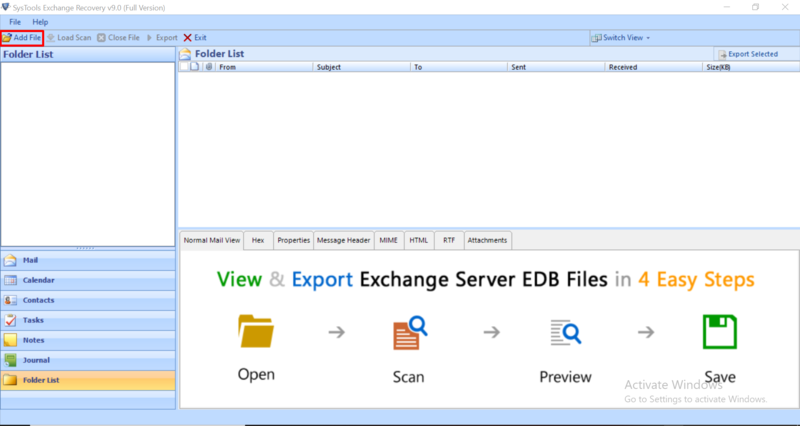 Can I get a brief idea about Exchange EDB to Office 365 migrator Software? 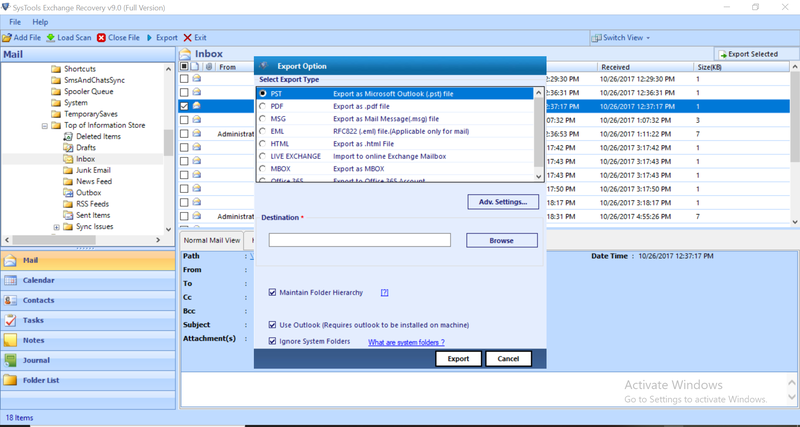 Provides Category selection to move exchange 2003 mailbox to office 365. Provision to migrate mailboxes, folders, and emails selectively using check boxes. Supports Windows 10 and all the below versions for Microsoft Exchange EDB to Office 365 migration. Mandatory to have Outlook installed prior to the migration. Supports MS Outlook versions such as Outlook 2000, 2003, 2007, 2010(32/64 bit), 2013, 2016 (32/64 bit) to export mailboxes from exchange 2010, 2013, etc. Is there any file size limitation imposed by the software? No, the tool does not impose any file size limitation to move mailboxes from exchange 2013, 2010 to Office 365. Can I bulk export mailboxes from exchange 2010, 2013, 2013 to Office 365 account? Yes, You can export multiple mailboxes in batches in few simple steps. 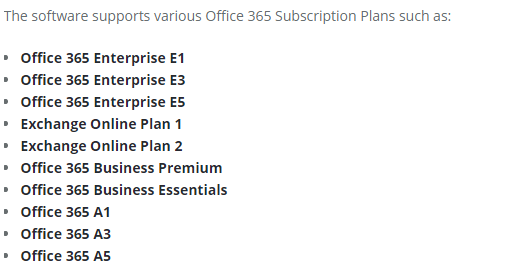 Which are the Office 365 Subscription plans supported by this utility to migrate EDB from Offline Exchange Server? There seems to be a lot too many software programs offering similar functionalities that makes them all look fake. This seemed to be a genuine Exchange EDB to Office 365 migration software with a unique set of features of its own. Very glad with the performance too, thank you SysTools. I couldn't be luckier than this. 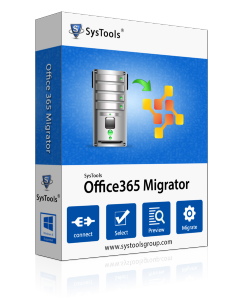 SysTools Exchange to Office 365 Migrator helped a lot while I was stuck with the large scale migration of my official Exchange mailboxes. I am very thankful to the developers of this application and to the entire team of SysTools. Exchange EDB to Office 365 migrator tool stands apart from other similar utilities due to it's simple as well as user friendly software interface. I would like to suggest it to all people who are in need of exporting files from MS Exchange account. This tool is the one of the finest software that is capable of migrating our large mailboxes. Your dedicated support staff was very helpful...several issues were addressed, some of which were unique to our environment. My comment to my colleagues about SysTools is...”We could not ask for anything more out of this wonderful, user-friendly tool’. SysTools Migrator has given us an awesome help, in the situation As I am generally new to the whole migration process, and experience serious difficulties. I have tried and resulted in much achievement . Much appreciated again for an awesome solution at a reasonable cost. I will definitely recommend you to my associates..
We have used this software successfully throughout our Project. We are totally satisfied with the performance and functionality of the tool. It has given us good results when we were needed to migrate a users data from a seriously out of date. We have used this tool with incredible accomplishment in our project. I have found this software extremely helpful and easy to use. I can suggest it as great and simple to use this tool for exporting mailbox items. I needed to thank you for your help and support. This software is an easy tool to use. I additionally needed to tell you how awesome and stunning your care staff is. Their direction and proceeded with help was well beyond – giving extraordinary client benefit, as well as they gave suggestions on how the device capacities most productively, which genuinely added to our accomplishment of this huge venture. It was not possible to moved my 6000+ emails (300mb) in very few minutes. All the best for 2018 and I will surely recommend this tool to other organizations. I have done alot of work with this tool and by far this is the best tool I have used	While the GUI could do with a revamp, the basis of the tool makes the experience much better than the other. It feels like you’ve had a full-time, good development team who knows what they’re doing rather. I am impressed with the product and I don’t believe I’ve ever said anything good about any software. Simply needed to thank you, folks, for saving my a whole a lot of time for exporting mailboxes of 100 gb which was a huge task. Awesome tool and will be my go-to for any future movements.. Using the tool we were able to migrate massive Exchange mailbox data to Office 365. Your tool helped us to overcome the situation which could have been disastrous for our organization. Thanks SysTools.